Over the last couple of months I’ve been asked to name my heroes…Cleveland heroes and heroes in general. I of course could blurt out a couple of them immediately but after giving it some careful thought I came away with something else. I know that there are plenty of people that are seen as heroes in the world...world leaders, politicians, clergy, etc. However I find that I am most moved and inspired by the heroic acts performed by everyday people who don’t even recognize themselves as heroes or their actions as heroic. Some of those people include the the co-worker that regularly spends bonus money on gifts for children in the Angel Network (Heather), or the one who leaves child size garden tools on your desk when she hears that they are really needed (Andrea). Or the person that takes the time to speak to everyone that comes by the garden so that they feel welcome and safe (Mr. Perry). I'm sure they didn't think these were heroic acts but through their efforts others are able to thrive. Sometimes the smallest act can make the biggest impact. It is those people who make things happen…in my life and in the lives of many others. I’d like to share some of those heroes with you. Ms. Robinson can be found at any number of community events and activities. She and her daughter Ayanna are always involved in community activities and are always encouraging other to participate! 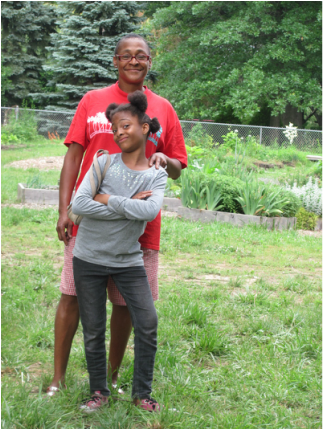 Ms. Robinson has a special way of connecting with our teens and Ayanna is the hardest working young gardener at City Rising Farm. She s involved in everything! Leah worked as our summer intern this year and impressed us with her ability to to work with everyone and make everyone feel important! We can't wait until she graduates and comes back home to NEO! She's one of the newest members of City Rising Farm. If you liked our stepped up social media presence it's Leah who got us there!! Loretta is our make things happen person. Her love of people moves her to make sure that opportunities are available for those in our community that would not normally have access to them. From helping seniors navigate the many systems to obtain services to boosting the self esteem of the youth of our community Loretta is always there to get it done! Johnteze and Lakeisha are the charter members of the CRF Teen Advisory Council. 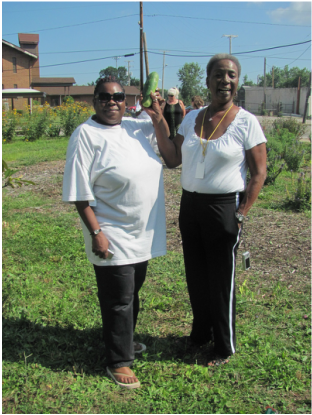 They will be helping to develop ways to increase community involvement and fresh food access in under served neighborhoods in Cleveland. Mrs. McGregor is the ambassador for sustainability at CRF. Together this team shows that inter-generational programming works! Mary Landers (right), and the rest of the Mt. Pleasant beautification committee for the fantastic Naturehood Garden on the corner of E. 112th Street and Kinsman Avenue. What a wonderful display of community cooperation! Francis is member of the Midtown Green Spot. He is a former Farmer of the Year from Ghana, is always ready to help in any way and readily shares his extensive knowledge of agriculture with everyone! Making toad houses for the garden! What we do for love of community! 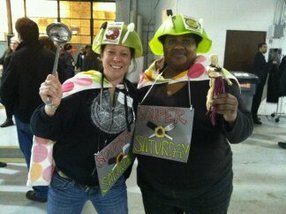 Lara and Elle at Cleveland Colectivo pitching for Souper Saturday. We weren't selected to move on but we won the big prize in terms of the relationships that came from participation! 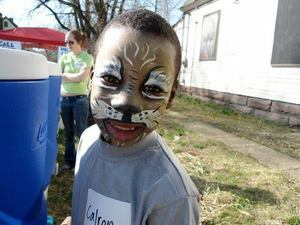 If you would like to support the work of City Rising Farm please check out the link below to see how! Today we had two visitors, Mr. Dylan and Mr. Darius from Boston. I learned that they are from the “Great Fresh Truck Stop” and they ride bikes around the country to raise funds for a mobile market. 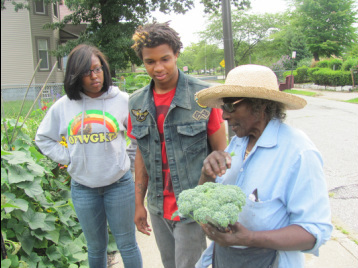 Danesha and I showed Mr. Darius and Mr. Dylan around the Blaine Avenue Community Garden and the Diversity Garden. 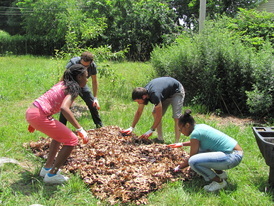 We also showed them how to make a quick garden bed using the sheet mulching and lasagna method. After we made the bed we had them plant it with radish, peppers, herbs, squash and beets in two other beds. We had so much fun today! Ms/ Robinson made some good fish, some hot dogs and corn on the cob. We also had a spring salad, cole slaw and potato salad. I had a good conversation with Mr. Dylan and Mr. Darius. It was fun watching Johnteze, Alvis, Gerald and Michael build the slip form bench. I think that everyone enjoyed this day that we spent together. Today we worked with Mr. Josh in the morning because Ms. Elle was at a meeting. 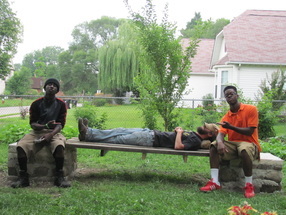 Mr. Josh, Johnteze, Michael and Alvis continued to build the slip form bench. 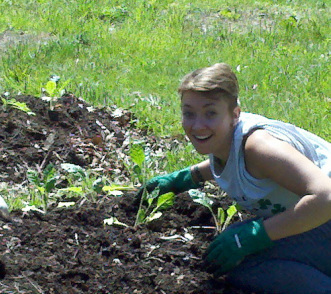 Danesha, Leah and I broke down beds and weeded. At 11:30a.m. we went to lunch at the Hough Library. When we came back we moved that plants that were on the side of the shed to the back and then took all of the empty flats and cell packs that were able to be reused to the back and organized them. We also planted a couple of plants in some pots. Today went by pretty fast. On Tuesday we started our morning off with some weeding. Danesha and Ms. Elle went over to Mr. Butch’s house to cut down some of his bushes. Mr. Butch is a neighbor and he helps out at the Blaine Avenue Community Garden sometimes so we decided to do him a favor and help him out with his front yard while Leah, Johnteze, Michael, Gerald and I weeded the children’s garden. When Danesha and Ms. Elle came back we added some more compost, alpaca manure and top soil to the front bed. We then planted cabbage, corn, pak choi and yellow squash there. There were some tough weeds in those beds too. They were really deep in the ground. I was introduced to this plant called thistle. It has thorns on it and you have to be very careful when walking around it. It is a weed but we left one in to grow because the flowers are pretty. Then we went to the Diversity Garden and cleared out the weeds and grass by the fence and rearranged the stones in one of the beds. Today we started work on building a trellis for beans. 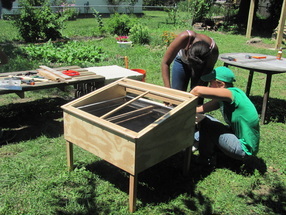 Danesha, Leah and I worked on one trellis panel and Ms. Elle, Johnteze, Alvis and Gerald worked on the other. We also broke down the beds over by the fence and weeded some beds as well. It started raining really bad so we had to stop what we were doing. It was a good thing is was then end of the day for us anyway. Finally it was time for us to make smoothies! Today was our first day back at work from a vacation. It started off by us walking around to see the changes in the garden. The herbs and watermelon radish that Mr. Dylan and Mr. Darius from The Fresh Truck Stop had started to grow. We also noticed a couple of strawberries had come up and they were ready to eat. Each of us was able to taste a strawberry. They were delicious and sweet! The corn, cucumbers and broccoli are starting to grow as well. We finished making the trellis for the beans and made three beds under them. We rearranged the trellis so we could have plenty of room to walk around it. Finally we refreshed some baby pool beds with alpaca manure and top soil so we could transplant some fruit, vegetable and herbs into them. We started our day late due to the fact that it was raining, thundering and had a lot of lightning. We spent all day weeding in the beds hat we had planted in the Diversity Garden. Some of those weeds were pretty tough. Mr. Josh. Alvis and Johnteze took the forms off of the slip benches that they made a week ago while Gerald took pictures of what everyone was doing. Today was a pretty cool day outside. It was not hot, the temperature was just right. 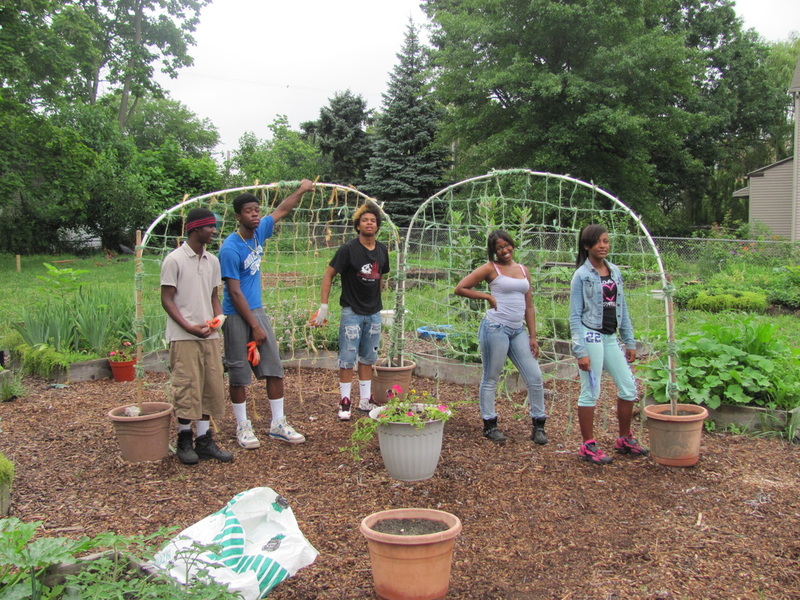 Danesha, Leah and I worked on the center trellis while Alvis, Gerald, and Johnteze designed a trellis in the Diversity Garden. After we completed the trellis we planted beans up under it and then cleaned up and then went on our lunch break. Finally it was time for us to make smoothies. 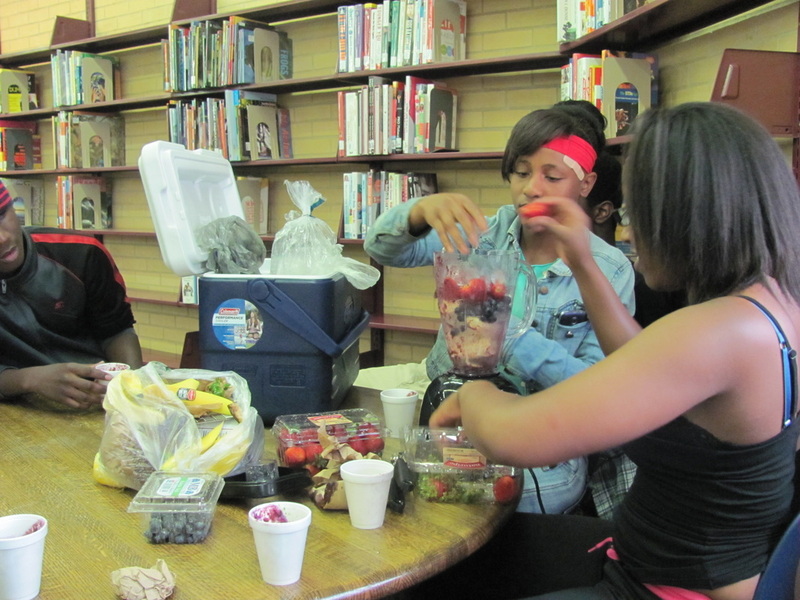 The first smoothie that we made and tasted had bananas, pineapples, collard greens and ice n it. I really didn’t like that batch. The second smoothie had bananas, ice, spinach, strawberries, blueberries, blackberries and mulberries. It tasted okay. The last batch had ice, bananas, strawberries, and blueberries and it was pretty good! 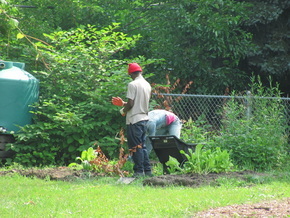 On Friday Johnteze, Alvis, and Gerald had to continue working on that trellis. It was a competition to see who designed the best trellis. While the boys continued to work on the trellis Danesha and I did some weeding. After that we found eleven pots and put composted woods chips, alpaca manure and top soil into the pots. We mulched the trees and then planted the pots with flowers and put them around the trees. "A Cleveland U.M.A.D.A.O.P. student even told me that I taught him something today. I felt like I really did my job and that put a smile on my face!" We had to prepare this morning for teaching the Cleveland U.M.A.D.A.O.P. 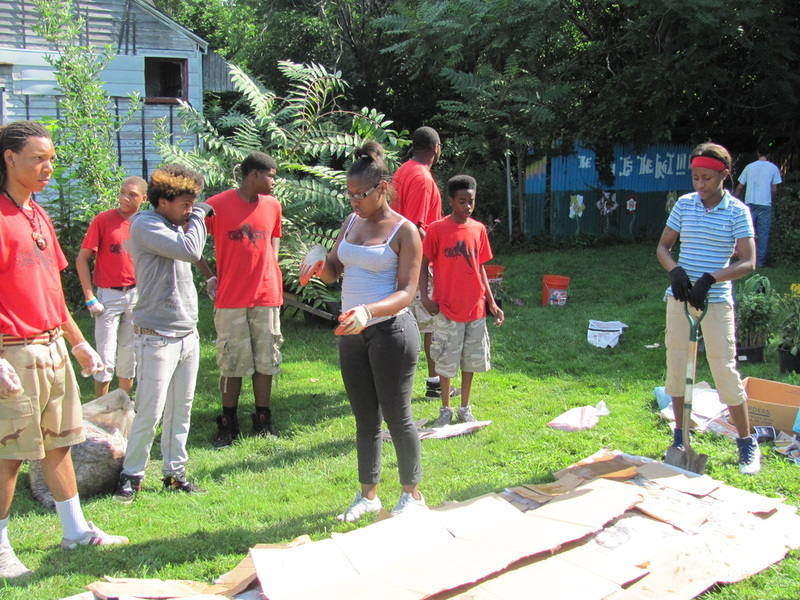 students how to build planting beds, weed and plant. We took some soil and flowers out of the beds to give to them. While we were doing this we had a visitor from Louisville, Kentucky. Her name is Ms. Gina Chamberlain and she was visiting to learn about how people in Cleveland work on hunger issues. We gave her a tour and took pictures. We talked with her a while and I really enjoyed her company. Mr. Josh and Ms. Lara came to help load up everything so we could go to Cleveland U.M.A.D.A.O.P. When we got there we introduced ourselves and then got right to work. We showed the Y.O.U. students how to make a planting bed. We put down newspaper, cardboard, leaves, straw, composted alpaca manure, and then top soil. Once we completed all those steps it was time to plant. We had plants for a butterfly garden, purple coneflower, black eyed susan and milkweed and also some herbs and vegetables. I had a great time teaching the students how to make and plant a bed. A Cleveland U.M.A.D.A.O.P. student even told me that I taught him something today. I felt like I really did my job and that put a smile on my face! 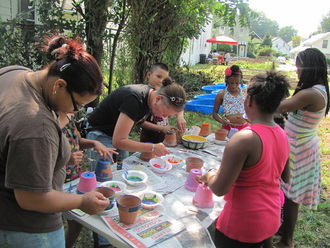 What's Happening at City Rising Farm! Join us for the Hearty Hearth Art and Environmental Education Series at the Dunham Tavern Museum. It's free family friendly fun and education and food! November's theme is Three Sisters. Learn the importance of this Native American method of farming through storytelling, crafts, and food! Bring what you can - food, drink, merriment, etc. We would love to see you, so if you can't bring a dish to share, please just bring yourself! But please, no dogs. Help cut the ribbon on our brand new High Tunnel Hoop House at 5pm; tour the gardens; be awed at what our Y.O.U. students and summer intern accomplished in the Diversity Garden; check out the cob oven in action; take a peak at our new solar dehydrator; sample some of our canned goods from our canning classes; weave something into the Earth Loom; enjoy good food, company and conversation. You get the idea...it's a celebration! Lots of friends, food and fun! The CRF High Tunnel Installed! We look forward to providing much more fresh food and urban agriculture education opportunities with this wonderful resource! Our Earth Loom is Up! Our Earth Loom is completed! Now people can leave a piece of themselves when they visit us at City Rising Farm! Please feel free to visit and weave something into our wonderful loom! Bring something to weave into the loom, (yarn, thread, fabric , plants, or pick something from our gardens. Is your part of the loom in remembrance of something or someone special in your life? We'd love to opportunity to share that with you through this community building activity! Today we went on two field trips with Ms. Elle and Ms. Lara. The first stop we made was to the First Unitarian Church of Cleveland. They have a garden which is located in the back of the church. Ms. Elle, Ms. McGregor and some other Blaine Avenue Community gardeners helped out getting the garden started and planted. I liked the design of the garden they even had a sitting area with tables that had chess boards built right in. This garden is a permaculture garden. 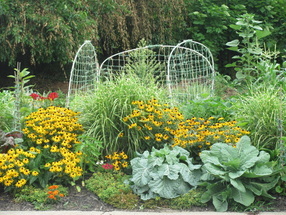 Permaculture is short for permanent agriculture. They had 150 volunteers help with the garden. The First Unitarian Church of Cleveland also has solar panels in the parking lot. People with electric cars can come there to charge them up. It is free for them to do this and everyone is welcome. When it rains they have gutters that collect the rain and it runs down into four big tanks that hold up to 650 gallons of water which is used to water the garden. The next stop was the Nature Center at Shaker Lakes. When we went inside the building it was cold. We saw a turtle, snake, toad black birds, chipmunks and squirrels. I got into a log in the center and Johnteze scared me with a fake frog that he put on my leg. I was so scared but it was so funny. We went outside and saw the shed that Mr. Josh and Ms.Lara helped build out of straw, sand, and clay. 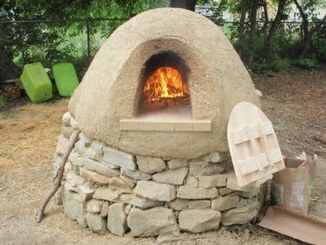 The shed looked similar to the pizza oven in our garden at City Rising Farm. .We also found out that Ms. Lara worked at the Nature Center for 3 years. I learned about cattails, a plant that takes up space. That is what happened to the field at the Nature Center at Shaker Lakes. The plant was invasive towards the other plants. It took up the sun, area, water, and food so volunteers had to go into the field and cut back that plant. We had so much fun at the Nature Center at Shaker Lakes! Then we headed back to our farm had lunch and then spent the rest of the day watering. We spent the day watering because we would not be in on Monday. We also walked around the garden and saw two squash that were ready to be harvested. We picked several cucumbers that were ready as well. We also picked onions, collard greens, and romaine lettuce. I did want some regular (butter crunch) lettuce but we had let the lettuce bolt. It tasted horrible but that was okay because it was a lesson learned. We will harvest the lettuce much sooner from now on. 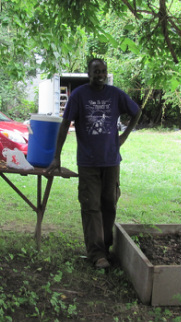 We filled up our rain barrel and Ms. Elle took pictures of us with the vegetables we harvested to take home. Everything is starting to grow pretty good and fast. The cucumbers are growing a lot. Now we are waiting for the corn and tomatoes to grow so we can pick them as well. Patience is a key factor in growing food! 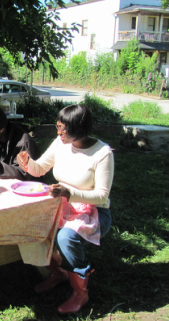 Hough vested community members and residents learned the water bath canning method by making salsa and pear-apple jelly this summer. They will now be able to preserve their own harvests and/or fresh produce purchases long beyond the growing season. There is nothing like opening a jar of your own vegetables in the dead of winter. Hmmm, it brings you right back to summer. 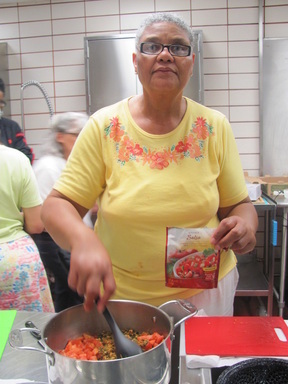 Thanks so much to the Thurgood Marshall Recreation Center team for use of their kitchen for these classes, Linnette Goard for her stellar instruction, Menu for the Future for the water bath canners, and Neighborhood Connections for their grant support! A special thank you to Tom Sersim and the Sheliga Drug True Value Team for providing $5 off canning supplies to all who took the classes.